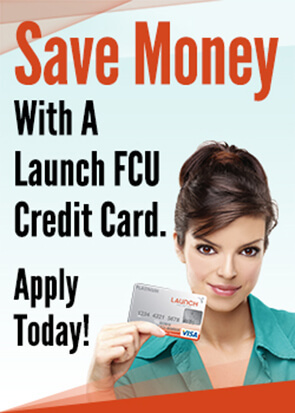 Launch FCU offers great ways to save. Choose from a savings account or Certificates. Terms offered range between 6-60 months and are federally insured by the National Credit Union Administration. The above accounts are variable rate accounts and subject to change. Fees may reduce earnings. Dividends on will be compounded monthly and credited on the last day of the month. "APY" means "annual percentage yield." APY effective 10/5/12 and may change without notice. Penalties imposed for early withdrawal. Effective October 1, 2008, dividends on all new and renewing Share Certificates and IRA Share Certificates will be compounded monthly and credited on the last day of each month and at maturity.